Das 1987 erbaute und in den letzten Jahren komplett renovierte und eingerichtete # 109 Defender in Schooner Bay ist komfortabel und attraktiv mit Granitplatten, modernen Schränken, neuen Möbeln einschließlich komplettem Entertainment-Center mit einem 4-Zoll-Samsung-Smart-TV (50 Zoll), Stereo-Soundsystem (mit Bluetooth) Stream von Ihrem Gerät), Hi-Def-Kabel, CD- und DVD-Player und Apple TV plus Split-System-A / C in allen Räumen. Das Hotel liegt etwas außerhalb von Christiansted und bietet hervorragende Einkaufsmöglichkeiten, Strände, Wassersportmöglichkeiten und Restaurants (eine der besten in der Karibik). St. Croix Das Wetter ist perfekt Jahr über und die Strände und Riffe gehören zu den schönsten der Welt. Schooner Bay liegt günstig in Gallows Bay, in der Nähe von Christiansted, St. Croix, USVI. Die gesamte Insel ist mit dem Auto oder Jeep zugegriffen werden kann; wir freuen uns, Sie bei Ihrer Auto Bedürfnissen zu unterstützen. Die Westside (Harbor View) Pool in Schooner Bay bietet einen Panoramablick auf Christiansted Harbor und die Riffe auf dem Meer. Die Eastside (Sea View) Pool bietet einen schönen Blick auf das Meer. Die Villa verfügt über eine sehr komfortable tropischen Stil Glas und weiß Rattan-Motiv. Eine komfortabel eingerichtete 30 'Gallery bietet eine Ansicht durch die Masten der Boote in der Marina in die Stadt, den Hafen und das Meer. # 109 Defender in Schooner Bay ist geräumig und bietet Platz für bis zu 5 Personen. Die Unterkunft verfügt über eine voll ausgestattete Küche, das oben beschriebene Unterhaltungscenter und einen schnellen Breitband-Internetzugang. Deckenventilatoren und Split-System zentrale Klimaanlage in jedem Zimmer. Komplettes Entertainment-Center mit 50 Zoll Vizeo 4K Smart TV, WiFi, Sony Stereo-Receiver / Verstärker mit Bluetooth zum Abspielen Ihrer Musik von Ihrem Gerät, CD- und DVD-Player. This was our first trip to St. Croix, but won’t be our last. The condo was very nice, well stocked and close to a few very good restaurant/bars, and close enough to the Boardwalk to walk. No Bones, and Ocean View Cafe are very close, and we ate at each place, a few times. Everything from breakfast to dinner was excellent. We met some really friendly people at the pool, who visit annually for extended stays, along with Peanut, the pool pup. Peanut was an added bonus for us, as dog lovers. The pool area is really nice, with a great view. Tom, the condo owner was very friendly, and helpful. Any questions we had he was very quick to answer. Tom left us passes to take a sunset sail on the Roseway. We thoroughly enjoyed, the 2 hour sail, and highly recommend it. We took a drive to Point Udell. It’s worth the drive, as it’s absolutely gorgeous. We did a dog days’ out with a shelter dog; we went to Cane Bay Beach. The drive along the Northshore, to Cane Bay is beautiful. We also enjoyed a “beach bum” day at Hotel on the Cay. It’s a nice beach, and the food was great as well. Our flight didn’t leave until 4:00, and Jonathon the condo manager allowed us to leave our bags in the office, so we could enjoy a final walk to town, and some pool time before we left. Upon inquiring about a taxi to the airport, Jonathan kindly offered to take us. We really appreciated his ride to the airport. St. Croix, in our opinion, is a nice combination of St. Thomas and the BVI. Thank you Tom and St. Croix for a great vacation. Very nice clean condo in good location! Nice condo in walking distance to town with nice small pool nearby overlooking the harbor. Tom was very nice to work with. Thank you, Jean and thank you for staying with us. We enjoyed being able to accommodate you. Great location in Gallows Bay. Beautiful Condo. Walking distance to Town and easy walking to parks, water front and excellent restaurants. Great communication pre-arrival. Nice and close to main pool with a nice gas grill. Very clean and well maintained - air conditioners in great shape, but did not need them very often. Easy walking to No Bones Cafe (right around the corner), The Bistro, and Maria's Cantina for eating out. Also an easy walk to Seaside Market & Deli if you need supplies for cooking. Slightly longer walk gets you to Fort Christiansted and the rest of the boardwalk for snorkeling, SCUBA, tons of other restaurants and bars. Plenty of room to spread out and relax and a nice big patio for drying out SCUBA gear or just enjoying the breeze. Thank you, Bill. Very happy you enjoyed. 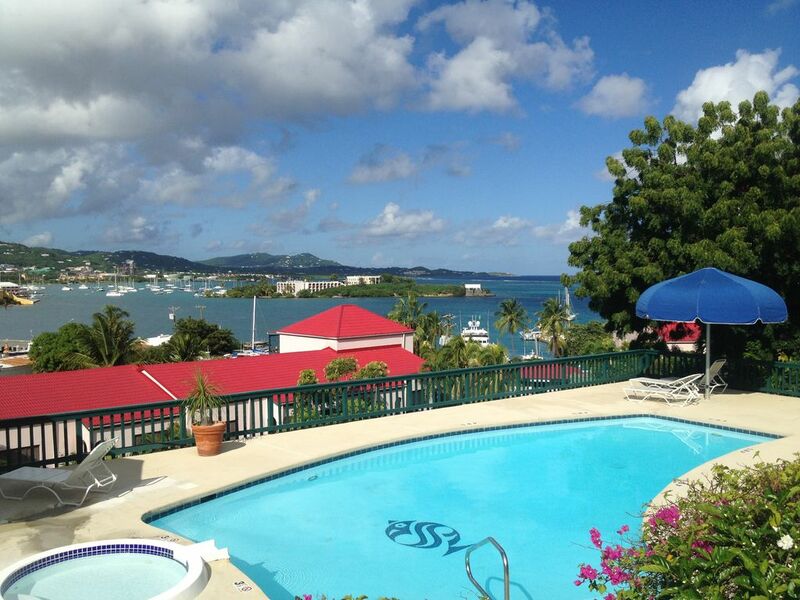 I am staying in the unit throughout the summer as I work on Disaster Recovery here in the USVI. The Unit is clean and in good repair, very centrally located, amenities (internet, cable, entertainment center, etc...) are well above average for the islands, and (I know this will seem like a minor issue but it is real important...) the Unit is assigned the best parking spot in the complex - lol. I have also had a chance to meet the owner, Tom, and he is a very nice guy. Thank you, Evan. We are glad you are enjoying your stay and thank you for the compliments. We really enjoy hosting our guests and helping them to make their St. Croix stay, whether business or pleasure, more rewarding. Stayed here 3+ weeks looking for long term place to live. Tom's place is clean, new furniture. Nice view of the harbor and close to downtown and the boardwalk. We didn't have cable the first couple of weeks, but it was finally restored just before we left. Noise and lights from the dock where supply ferry's coming in can be a distraction once in a while - but nothing terribly out of hand. Road you have to take to get to complex needs a lot of work as well. Internet there is great~! I thought pricing may have been a bit high for the place, but we needed a place and this one worked. We would stay there again. Thank you very much, Bill and Angie. Glad you enjoyed your stay and you can't beat the convenience of the Schooner Bay location. Sorry about the road in front. Public Works and the Port Authority have a plan to improve the road which we hope will be implemented soon plus the supply dock is going to be relocated to the south shore. Very happy you liked the decor and cleanliness. My wife, Ann, and Carmel, our housekeeper, work hard to keep the place nice for guests and I will be sure to pass your compliments on to them. All the best in your search for a home here in St. Croix.